Moving to a New Office? Check Out These Tips! Every moving job presents unique challenges, yet moving a business to a new office requires extra attention, considering all the employees and customers who could potentially be affected by the move. But it’s often the case that adequate planning and preparation are the building blocks of a smooth relocation. Therefore, by following tips from the professionals at a local moving company Gainesville, FL, business owners can discover how best to prepare for a commercial move. Regarding your employees in Gainesville moving the office could affect the distance of their commutes to work or cause other questions to arise, such as whether certain employees will keep, gain, or lose their offices in the new building. In order to have sufficient time to address questions or concerns from your office personnel, you should inform all employees about the move six months in advance. Considering the year-round demand for local moving services, the appropriate time to schedule movers in Gainesville, FL, for a commercial move is as soon as you know that the relocation of your business is official. Ideally, you’ll want to hire movers at least six months before the moving date to ensure the movers will be available, as well as to give yourself ample time to prepare for the move. Since the contents of your office, such as computers, furniture, and documents, are essential to the functioning of your business, it’s important to hire movers Gainesville businesses trust to pack, transport, and unload their commercial assets securely. Experienced commercial movers also know how to work efficiently in order to avoid interruptions to business operations during a relocation. One way to find qualified movers in your area is to choose a moving company with dedicated business relocation services. When it comes to relocating businesses in Florida movers recommend certain steps to make the relocation as efficient as possible. Perhaps the top tip from movers Gainesville, Florida, businesses learn is to downsize office contents before relocating. Particularly when a business has occupied an office space continuously, excess chairs, obsolete office equipment, and other superfluous items can accumulate. Selling, donating, or discarding unnecessary office contents is an effective way to make a business relocation more efficient by reducing the amount of items to pack, load, and transport. While looking for a commercial space for rent, you may have given some thought to how your furniture and office equipment should be arranged. While packing before the move, you can use colored labels to signify the rooms or areas of the new office where boxes and other items should be placed. During the unloading process, the movers can then use the labels as guides for how to organize the contents of the office, so your employees can have a proper environment to resume their work. As soon as your business moves, you should update the address and contact information on your website and Google Business page as well as in local business directories. Depending on your industry, it may also be appropriate to announce your new location with a direct mail campaign or an email blast. UF Mover Guys are the commercial moving experts in Gainesville, FL. As a full-service moving company, we oversee the relocation of your business from start-to-finish, and we charge no travel or fuel fees for local moves. You can also hire our movers for a single service, such as professional packing, loading and unloading, or transportation. We also offer short-term storage solutions, do-it-yourself packing materials, and moving truck rentals. Meanwhile, UF Mover Guys are also Gainesville’s go-to movers for employee relocations as well as residential and student moves. Contact us for more information! Just as you rely on your car in the course of daily life to get you to work, school, or the store, so too could your vehicle play a critical role in an upcoming move. For larger relocation jobs, it’s advisable to schedule a moving company Gainesville, FL, residents trust to load and transport your belongings in a moving truck. But for smaller moves, your car may have enough space to hold all your things, just as long as you prepare for the move and pack your vehicle correctly. As experienced movers in Gainesville, FL, know, the preparations for a move are just as, if not more important, than the relocation itself. 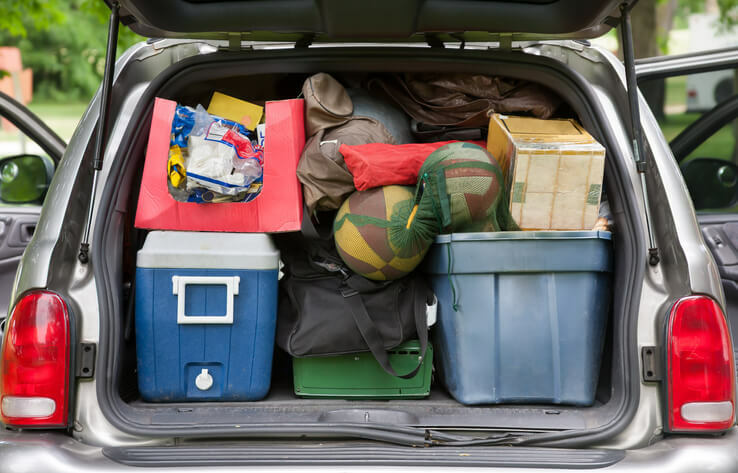 In order to prepare to move using your own car, which has limited interior storage space, take steps to reduce the quantity of your possessions as well as the volume of the items that you’ll pack. One piece of advice from movers Gainesville homeowners find useful is the suggestion to downsize before moving. Downsizing involves sifting through your possessions and dividing the items you can’t live without from the superfluous things that aren’t worth keeping. As you’ll discover, downsizing doesn’t just reduce the amount of things to pack into your car, but the items you’re not keeping can be sold on Craigslist or eBay to earn gas money for your trip. In Gainesville moving companies train their movers to make certain items more compact to fit into boxes easier. Similarly, while preparing your clothes for moving, you can use vacuum bags to shrink the volume of your wardrobe to a fraction of the space your clothing would otherwise have occupied in a traditional suitcase. Furthermore, instead of hard suitcases and boxes, pack your things into soft duffel bags, which can flex and mold to fit into narrow spaces inside the car. Some of the techniques used by movers Gainesville, Florida, residents hire to pack boxes can likewise serve as useful approaches to packing your vehicle. When movers pack a moving box, they insert larger items first and fill voids with smaller items, while always being careful not to crush an item. Likewise, the first items inserted while packing a car should be the larger items, such as furniture, and then smaller items should fill the remaining spaces. For the sake of safety, all the car mirrors should remain visible to the driver, and if the driver’s view becomes obstructed after packing, items may need to be removed from the cabin and added to an overhead storage rack until visibility is restored. In Florida movers are trained to unload moving trucks in hot or rainy conditions. But while unloading your car, particularly following a long car ride, avoid over exerting yourself by moving quickly or carrying too many items simultaneously. Instead, unload items one-by-one with only one door open at a time to prevent your belongings from spilling out of the car. And whenever you step away from the vehicle, lock the doors to keep your possessions secure. Furthermore, in order to keep your new home organized, refrain from merely carrying items inside and instead make the effort to place things in the rooms where they belong. As a friendly reminder, after moving to a new address, you must update the registration for your car, as well as the address on your driver’s license, by visiting your state’s department of motor vehicles, which in Florida is the Department of Highway Safety and Motor Vehicles (DHSMV). UF Mover Guys is the choice provider of moving services for students, residents, and businesses in Gainesville, FL. Whether you’re moving to an off-campus apartment across town or a new house on the other side of the country, our movers have the expertise and resources to execute your relocation. Or you can hire us for individual moving services, including packing, loading and unloading, transport, or short-term storage. And UF Mover Guys is also your local source of do-it-yourself packing supplies, moving trucks for rent, and moving tips. Contact us to discuss your relocation needs!